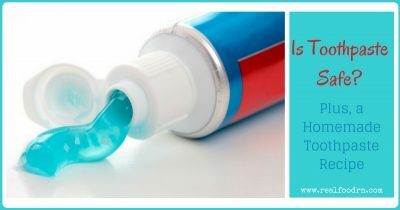 Have you checked the label on your toothpaste lately? Sure, they advertise that it will fight germs for up to 12 hours, helping to fight plaque and tartar and prevent gingivitis, while also whitening your teeth and giving you minty fresh breath. But, there is something they are NOT telling you about that pretty blue and white swirl on your toothbrush. Many of the ingredients in that little innocuous tube are more harmful than you know. Let’s take a gander, shall we? This one is a hot topic of controversy! We personally believe that fluoride is harmful and filter it out of our water using this filter. I have read up on fluoride extensively and when I came across an article explaining it as having adverse effects on children’s neurodevelopment, I decided that we do not need fluoride anywhere in our house or personal care products. Such as saccharin and other sweeteners to provide taste. Saccharin has been linked to bladder cancer in rat studies. These are generally benign, but I listed them anyway. Synthetic cellulose: this is wood pulp that is processed, dried, and then bleached. Yum! So, there you have it. A general breakdown of what might be in the toothpaste you are buying at the store. Even some of the “natural” toothpastes contain these, so always check your labels. OR, make your own homemade toothpaste! Making your own homemade toothpaste is not only easy (and fun! ), but it is also cost effective. Many of these ingredients you will already have in your cupboard and this batch will last you a while! If you do not want to make your own, HERE is my absolute favorite healthy toothpaste! Use as needed to brush your teeth and have minty fresh breath!